Try Pink Grapefruit and enjoy a subtly sweet and tangy flavor that tastes fresh off the tree. (Without, you know, having to climb a tree). Enjoy Strawberry Lemonade, the taste of juicy strawberries paired with sparkling lemonade. It begs the question: can there be too much of a good thing? We certainly don’t think so. Luscious strawberry and sweet watermelon make quite the pair. In fact, we think they’re getting married. Enjoy a sweet twist of lush pomegranate and blueberry flavor. So delicious, it’ll be love at first sip. Try Pomagranate Blueberry. Enjoy a Peach Nectarine today! We’re not quite sure what the difference is between a peach and nectarine, but it doesn’t really matter—we ended up taking the best of both and made sweet, juicy bliss. Lemon Lime, so divine! We brought a new, sparkling twist to this classic citrus combo. Try it today. An irresistible blend of luscious strawberry and vibrant kiwi flavor. They go together so perfectly, we’re surprised Mother Nature didn’t come up with it first. 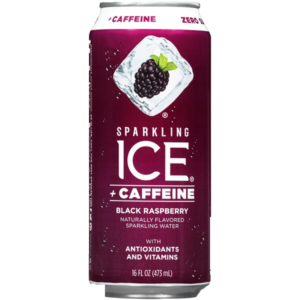 Juicy grape flavor mixed with the mouthwatering taste of raspberries. It’s not just good, it’s grape. Enjoy a Crisp Apple for flavor so refreshing, you’ll want to dunk your head in water and go bobbing for this instead. 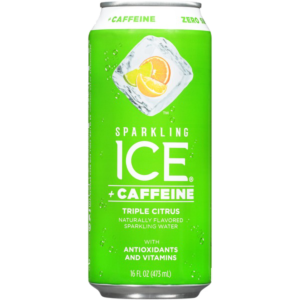 Ginger Lime is a refreshing, full flavored sparkling water that kicks with spicy ginger and chills with lime. Transport yourself to the beach with tropical pineapple and tantalizing coconut flavor. (Mini umbrella not included). Try Cherry Limeade – The sweetness of fresh cherries mixed with a hint of tangy lime create a flavor so out of this world, you can taste it from space. Try your new favorite flavor today. It’s sweet. It’s juicy. It’s Black Cherry. 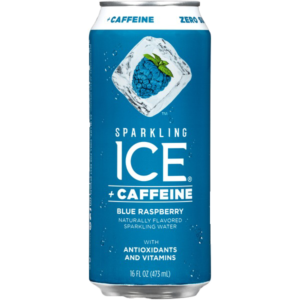 Sparkling Ice +Caffeine contains 70mg of caffeine antioxidants and vitamins. It is also a zero sugar and zero calorie beverage.